The enemy aircraft were growing ever bigger, almost filling my windshield. I could now clearly see the wide, red fuselage bands. I attacked from above slicing through the formation at the highest possible speed before pulling up sharply to target the second flight of the bomber stream. Within seconds my presence was detected and I was greeted with a wild volley of bullets. Hang on now, don’t panic, hold your fire until you’re really close! The aircraft on the right is growing in my sights. When its starboard engine completely fills the gun sight I move my fingers to the gun triggers. At just 20 meters the three guns begin to rattle. There is a bright flash of fire as I haul on the stick and stand my aircraft on the tail. In the corner of my eye I catch a glimpse of the enemy bomber exploding in mid-air and falling to the ground in hundreds of pieces. I am completely calm and composed, which clearly cannot be said of the flight leader: having lost his cool he drops the nose and runs for the deck in a mad dash. I quickly catch up with his flight and position myself behind his left wingman. As the white trails of tracer rounds are streaking past my aircraft, I again put my machine guns to work. There is a flash of fire followed by a loud explosion and within seconds I’m flying through the spot where the enemy bomber used to be just moments ago: now it’s just a cloud of smoke and burning debris. It’s just me and the flight leader then. Within seconds his machine too is engulfed in a ball of fire and disintegrates in the air. The remaining bombers are bogging out in a loose formation. I decide to give chase targeting the lead flight. Taking a quick look around I spot Rata fighters setting up for an attack, hell-bent on knocking me out of the sky. I also notice three 109s whose pilots have already detected the threat and are on their way to join the fight. “The leader has to go down” – the thought replays itself in my head like a mantra. I can now clearly see the lead flight at my 12 o’clock, still maintaining a fairly tight formation. The only way to get to the leader is to squeeze right between his two wingmen. As I hurl my aircraft between the two enemy machines, just barely clearing their wingtips, the gunners open up on me. I can see the blue muzzle flashes and hear the ominous rattling sound of bullets hitting the fuselage of my fighter. It is too little, too late, though: my machine guns also begin to talk and seconds later the enemy bomber is falling out of the sky like a comet trailing a tail of fire and thick smoke. There goes number four of the day. The Messerschmitt Bf 109, also known as the Me 109, is without a doubt one of the most remarkable fighter designs in the history of military aviation. Built in the record-breaking numbers (over 32 000 examples) it was one of the iconic symbols of the Luftwaffe’s might. The Bf 109 produced not only German top-scoring aces of the war, including Erich Hartmann (352 kills), Gerhard Barkhorn (301 victories), Günther Rall (275 kills), Hans-Joachim Marseille (158 kills), Werner Mölders (114 victories) or Adolf Galland with 104 confirmed kills, but also fighter aces from other nations: Finland’s Ilmari Juutilainen (94 kills, including 58 in Bf 109s), Hans Wind (75 victories, 36 in Bf 109s) and Eino Luukkanen (56 air-to-air kills, of which 39 were scored at the controls of the Bf 109); Hungarians - Dezsö Szentgyörgyi (31 kills) and György Debrödy (26 victories); Croatians - Mato Dukovac with 44 kills and Cvitan Galic (38 air-to-air victories); Slovaks - Ján Režnák (32 kills) and Izidor Kovárik (28 victories); Romanians - Alexandru Serbanescu (49 kills) and Constantin Cantacuzino (43 air-to-air victories); Bulgarians - Stojan Iliev Stojanov (5 kills) and Petar Angelov Bochev (5 victories), or Italian aces Adriano Visconti di Lampugnano (26 kills) and Teresio Martinoli with 23 aerial victories. The Messerschmitt Bf 109, similarly to its nemesis the Supermarine Spitfire, was the aircraft that already at its inception set new trends in the development of fighter designs. It was one of the first mass produced single-seat, all-metal monoplanes with retractable landing gear and fully enclosed cockpit. For ten years, from the start of production in 1935 until the war’s end in 1945, it remained one of the world’s most potent fighter aircraft. The Bf 109 will always be associated with its chief designer Wilhelm Emil Messerschmitt (better known as Willy). Born in Frankfurt am Main on June 28, 1898 Willy moved with his family to Bamberg in 1906 where his father was to take over his brother’s wine merchant’s business. Willy began to build his first rubber-powered models when he was only 12 years old. A year later he met the pioneer of German glider design, Friedrich Harth, who recognized the young Messerschmitt’s talents and invited him to join his design team. Shortly before the outbreak of World War I they finished work on the S 4 glider. Soon thereafter Friedrich Harth was drafted into the army, while the S 4 glider, stored in a shed on Heidelstein mountain near Bischofsheim, was vandalized. The 16 year-old Messerschmitt used the materials from Harth’s workshop to build his first full-fledged flying machine – the Harth-Messerschmitt S 5 glider. Friedrich Harth flight tested the glider in early September 1915 during his short leave from the service. Harth made several flights ranging from 80 to 300 meters, but was not overly impressed with the machine’s performance. Shortly thereafter he designed and built its successor, the S 6. In the meantime Messerschmitt passed his final high school exams in 1917 at Oberrealschule Nürnberg and was promptly drafted into active military service. Between June 5 and November 8 he underwent basic training at Fliegerpionierabteilung Milbertshofen. Willy continued working closely with Harth, who by that time had finished work on the S 7 glider, followed by the S 8 design that was ready soon after the war’s end. The S 14 design enjoyed some success at the Rhön glider competition held on August 20, 1923. Messerschmitt’s glider came in first in the maximum flight ceiling category and second in the flight endurance event. The S 15 was a high wing, all plywood design powered by the 10 HP Victoria engine. The machine was ready in the early spring of 1924. Within the next few months Messerschmitt designed and built two more powered gliders – the S 16a and S 16b. The machines also took part in the Rhön competition, but did not fare well due to a series of engine malfunctions. The man who stole the show and took virtually all prizes was Ernst Udet at the controls of his famous “Kolibri”. Discouraged by the lackluster performance of his powered gliders, Messerschmitt turned his attention to the design of light aircraft. His first machine, designated M 17[The letter “S” stood for Segelflugzeug, or a sailplane, while the letter “M” designated Motorflugzeug, a powered aircraft. ], was a two-seat, all-wood light aircraft that featured cantilevered high wing and a conventional puller propeller. Messerschmitt built seven examples of the aircraft powered by various types of powerplants ranging from 24 to 28 HP. One of the M 17s, W.Nr. 24, D-612, was flown by Carl Croneiß during the Internationaler Flugwettbewerb held in Schleißheim between September 12 and 14, 1925. The aircraft won the maximum flight ceiling and speed events and came in fifth in the relay race, which earned Messerschmitt 6 750 marks in prize money. Messerschmitt scored another success when his M 17 W Nr. 26, D-612 was entered in the light aircraft competition held from May 31 to June 14, 1925. Flown by E. von Cont the aircraft came in first in the overall flight performance category. The success of Messerschmitt’s designs did not go unnoticed. Among those who took interest in the work of the young engineer was Theo Croneiß, the founder of Nordbayerischer Verkehrsflug GmbH Fürth, who was looking for a light passenger aircraft for his company. The four-seat machine was to be based on the M 17 design. With the maximum unit price set at 25 000 marks the aircraft would cost a third of similar planes in use at that time. The new aircraft, designated M 18a, would be an all-metal design powered by a seven cylinder Siemens-Halske Sh 11 engine developing 80 HP. The first prototype was flight tested by Theo Croneiß himself on June 15, 1926. Following the completion of the flight test program the machine received its registration – D-947. Soon to follow was the M 18b - a modified version of the aircraft designed to carry five passengers. At around that time the assets of the bankrupt Udet-Flugzeugbau GmbH were taken over by the newly established Bayerische Flugzeugwerke (BFW). Soon the new company would expand and acquire grounds and production buildings of the former Rumpler-Werke AG in Augsburg. Since the Reich’s Ministry of Economy (Reichswirtschaftsministerium) regulations did not allow subsidizing two aviation companies based in Bavaria, the concerns were merged. The new entity, Flugzeugwerke AG Augsburg, would soon launch the production of aircraft designed by none other than Willy Messerschmitt. The official contract was signed by Messerschmitt on September 8, 1927. The first aircraft to be built by the new company was an all-metal BFW M 20, which was designed to carry ten passengers and two crew. Deutsche Luft Hansa Berlin ordered two prototypes of the new aircraft. The first one, M 20 W.Nr. 371, was ready by February 26, 1928 and took off for its first flight on the same day. The flight went well until a skin panel separated from one of the wings, just aft of the leading edge section. Hans Hackmack, who was at the controls during the ill-fated flight, misjudged the situation, panicked and tried to bail out of the aircraft that flew at just eighty meters above the ground. Hackmack was killed on impact with the ground and the aircraft was completely destroyed. Following the crash of the first prototype the Deutsche Luft Hansa order was cancelled. Nonetheless, the BFW finished work on the second machine and flight tested it on August 3, 1928. Flown by Theo Croneiß himself the aircraft performed so well that Deutsche Luft Hansa decided to order two BFW M 20as powered by 700 HP BMW VI powerplants. A year later the company submitted an order for two more aircraft, this time the modified M 20b version. In 1928 the BFW Augsburg was to be floated. Willy Messerschmitt feared that he might lose his independence as a designer should an external investor become a majority shareholder. He therefore began to look for a potential business partner. Messerschmitt eventually managed to convince the Stromeyer-Raulino family from Bramberg to invest 330 000 marks in the company’s stock, while he himself came up with 70 000 marks, the proceeds from the sale of his old company’s assets to the BFW AG. In the late 1920s the BFW built a number of prototype designs, including the M 21 trainer, twin engine M 22 and a light sports trainer M 23. The 1930s began on a sour note: on October 6, 1930 one of the M 20bs, W.Nr. 443, D-1930, crashed on approach to Dresden during a scheduled Berlin –Vienna flight. Eight people perished in the crash. Several months later, on April 4, 1931, another M 20b (W.Nr. 442, D-1928) crashed during a Muskau – Görlitz flight, killing the pilot and radio operator. Four of the eight Reichswehr officers traveling onboard the ill-fated plane suffered minor injuries. The incidents resulted in the cancellation of Deutsche Luft Hansa order for two more M 20b2 aircraft and brought about an open conflict between Willy Messerschmitt and Luft Hansa’s director general, Erhard Milch. After Milch had become the secretary of state at the Reich’s Aviation Ministry, the animosity between the two men flared up again and would continue until the war’s end in 1945. In the meantime the BFW lost ten more aircraft orders, which sealed the struggling company’s fate. On June 1, 1931 the BFW management officially filed for bankruptcy at Augsburg court. In those dire circumstances Willy Messerschmitt decided to return to his old company Messerschmitt-Flugzeugbau GmbH and continue the design work. Not long thereafter several German aeronautical companies (including Messerschmitt-Flugzeugbau GmbH) received invitations to deliver six aircraft that would represent the country [The official name of the event was FAI – Challenge internationale des avions de tourisme.] during the 1932 edition of an international aviation event, known in Germany as Europa-Rundflug [The winner of the 1929 and the 1930 editions of the vent was a German pilot Fritz Morzik.]. Messerschmitt’s contribution was a super modern design designated M 29 – a low-wing aircraft with a fully enclosed cockpit, whose graceful lines resembled those of a modern fighter. On April 13, 1932 the machine was test flown by Erwin Aichele. The tests revealed superb flight characteristics of Messerschmitt’s new design: it had a top speed of 250 kph, a time to climb to 1 000 m of just 3 minutes and the operating ceiling of 6 000 m. Unfortunately, the aircraft suffered two accidents on August 8 and 9, 1932, which effectively ended its chances of entering the competition. The event’s top prize went to a Polish pilot Franciszek Żwirko flying the RWD-6 aircraft. Messerschmitt continued work on other designs, although several of them (M 30, M 31, M 32, M 33 and M 34) did not proceed beyond the drawing board [The M 31 prototype was in fact built as W.Nr. 607 and flight tested in early August 1932 by Erwin Aichele.]. In the meantime Peter Rakan Kokothaki took over as the president of the BFW AG, which was still under bankruptcy protection. Kokothaki worked closely with the company’s administrator to find ways of ending the concern’s financial problems. As a result an agreement was reached with the company’s key creditors, which was officially sanctioned by the ruling of Augsburg district court dated April 27, 1933. Based on the court’s decision the company was cleared to re-start its operations on May 1, 1933. During the same period of time Messerschmitt designed another light trainer/aerobatic aircraft, the M 35. Fifteen examples of this low-wing, cantilevered design were built. The aircraft was a two-seater of mixed construction and featured a tapered wing. After the Nazi’s rise to power in 1933 Germany saw a gradual process of restoration of its independence, which until then had been severely curtailed by the Treaty of Versailles. One of the first priorities of the newly established government was the rebuilding of Germany’s armed forces, which had been previously limited to 100 000 members of the Reichswehr. The air force, armored units and the submarine fleet were abolished altogether. In September 1933 the Reich’s Aviation Ministry (Reichsluftfahrtministerium – RLM) submitted a requirement for six prototypes of a four-seat “liaison” aircraft (known in the German nomenclature as Reiseflugzeug. The order was placed with Bayerischen Flugzeugwerke and the new aircraft was to be ready for the 1934 edition of the Challenge event. Similar orders went to Fieseler (Fi 97) and Klemm (Kl 36). The companies were given only nine months to design, build and flight test the new aircraft. Willy Messerschmitt personally coordinated the work on the new design, supported by Robert Luser as the project director, Richard Bauer as the design office chief and the head of flight test department, Hubert Bauer. The new aircraft was a cantilevered low-wing design with retractable landing gear. The single-spar wing featured all-metal skin, automatic leading edge slats and fowler flaps. The wing sections could be folded by removing a bolt in the wing’s center box. The gear retracted outwards into the wing bays, activated by a manual worm drive gearbox. The aircraft featured a conventional, fixed tail wheel. The first prototype of the Bf 108 A V-1 (D-IBUM) was flight tested in June 1934 (at that time the aircraft was equipped with a wooden wing). Within the next month the remaining five aircraft were ready, with the last example making its first flight on July 28, 1934. Shortly after the German pilots had begun their workups in preparation for the upcoming competition, a tragedy struck. One of the Bf 108 A V-1s hit a tree during a slow flight practice and crashed, killing its pilot Freiherr Wolf von Dungern [Hitchcock Thomas H., Typhoon, Boylston 1979, p. 2]. In the aftermath of the accident manager of the German team, Theo Osterkamp, demanded that the Bf 108 be withdrawn from the competition. The RLM representative Maj. Fritz Loeb ignored Osterkamp’s pleas and four Bf 108s did took part in the event (Bf 108 A V-3, W.Nr. 697, D-IZAN, Bf 108 A V-4, W.Nr. 698, D-IGAK, Bf 108 A V-5, W.Nr. 699, D-IMUT and Bf 108 A V-6, W.Nr. 700, D-IJES [Ebert Hans J., Kaiser Johann B., Peters Klaus, Willy Messerschmitt – Pionier der Luftfahrt und des Leichtbaues, Bonn 1992, p. 100.]). Because the rules of the Challenge favored the aircraft capable of performing various slow-speed maneuvers, the winner of the event was a Polish flyer Jerzy Bajan at the controls of the RWD-9. Theo Osterkamp flying the Bf 108 A V-5 (W.Nr. 699, D-IMUT) did win the top speed event hands down (291 kph over a 300 km course), but that was not enough to reach for the competition’s top prize. Eventually Osterkamp came in fifth overall, with Werner Junck just behind him in the sixth place. Another German pilot, Carl Francke, finished sixteenth, while Otto Brindlinger was disqualified after committing an error on one of the rally’s legs. Nonetheless, the Messerschmitt’s design was enthusiastically received by aeronautical experts from all over Europe. The aircraft’s excellent flight performance caught attention of the RLM officials, who promptly placed an order for 45 examples of the modified Bf 108 B version. The machine was to enter service with the German air force as a liaison aircraft. The RLM’s interest in his design was unquestionably a personal victory for Messerschmitt, especially that the RLM’s secretary of state in charge of all aeronautical production in Germany, was Willy’s archenemy Erhard Milch. Initially Milch tried to marginalize Messerschmitt’s ambitions by planning to use the BFW facilities for license production of other manufacturers’ designs, including 30 examples of the Dornier Do 11, 70 Heinkel He 45s, 35 He 50s, 90 Arado Ar 66s and 115 examples of the Gotha Go 145 [The Flugzeug-Beschaffungsprogramm 1935-1937 of November 1, 1935 (RLM, LC II/13271/35) also mentions 50 examples of the Junkers Ju 87, which actually never went into production at the BFW plant.]. The successful debut of the Bf 108 in a coveted international competition resulted in the RLM orders for 7 version 0 examples of the aircraft, followed by 45 serial production machines. Additionally, 10 version 0 Messerschmitt Bf 109 fighters were ordered, supplemented by 8 version 0 examples of the Bf 110 “destroyer” aircraft. Dear Mr. Croneiß, I am writing to you in strict confidence to assure you that I view your efforts to energize the aeronautical industry in Bavaria as critically important. I have no doubt that your passion for work will soon bear fruit in the shape of an aeronautical company capable of delivering a first class transport aircraft!!! Of equal importance, however, is the development of an extremely fast liaison aircraft, a single-seater of course!!! If you feel you do not have sufficient expertise in the design of such aircraft, we can certainly discuss the matter further and perhaps start license production in your facilities. This way the company could gradually reach the necessary level of experience and recruit skilled work force to undertake design and production of the new types. I do insist that you look into the matter closely and offer your opinion at the earliest opportunity. It is in our best interest to establish in Augsburg a strong aeronautical company [A letter from Hermann Göring to Theo Croneiß, dated October 20, 1933. In: Ebert Hans J...., pp. 110-111.]. What Göring meant by a “first class transport aircraft” was in fact a bomber, while the “extremely fast liaison aircraft” was a reference to a single-seat fighter. 8. Range or flight endurance: 11/2 hours at maximum speed at 6 000 m.
15. General remarks: ad. 3: provide the best possible cockpit visibility for air-to-air combat; ad. 4: fixed armament should provide the widest possible field of fire and ease of maintenance; ad. 7 – 11: in terms of flight characteristics the aircraft should be easy to operate by a pilot of average skills. The required flight endurance is to be understood as the total flight time at 6 000 m, including take-off roll and a glide during the approach phase. The maximum airspeed at the operational ceiling of 6 000 m must be maintained up to 20 minutes. Aircraft must be fully controllable in dives. Aircraft must be easily recoverable from spins. Turns at operational ceiling must not result in a loss of height. In February 1934 the RLM forwarded the tactical specifications of a light fighter aircraft to three companies: Arado, BFW and Heinkel. Focke-Wulf did not receive the documentation package until seven months later, i.e. September 1934 [Many authors, including Robert Michulec (Messerschmitt Me 109, vol. 1, Gdynia 1997, p.. 9), maintain that BFW was in fact not invited to participate in the project, which would have been understandable given the animosity between Erhard Milch and Willy Messerschmitt. However, there is no support of that version in the historic data. In fact it was Focke-Wulf that received the fighter specs seven months later, the evidence of which can be found in Radinger Willy, Schick Walter: Messerschmitt Me 109, das meistgebaute Jagdflugzeug der Welt, Entwicklung, Erprobung und Technik, alle Varianten: von Bf (Me) 109 A bis Me 109 E, Oberhaching 1997, p. 15 and in: Ritger Lynn, The Messerschmitt Bf 109, A Comprehensive Guide for the Modeller, Part 1: Prototype to „E’ Variants, London 2005, p. 8.]. In early March 1934 head of BFW’s design bureau, Robert Lusser, began a series of meetings at the RLM to clarify some of the particulars of the proposed fighter’s technical specs. Among the subjects discussed in those meetings were issues concerning the choice of powerplant and details of the aircraft’s armament. The future fighter was to be powered by a twelve-cylinder, inverted V engine: the 610 HP Junkers Jumo 210 A (to be installed in prototypes) and the 750 HP BMW 116 in production examples. At least three different configurations of fixed armament were considered: one MG C30 20 mm cannon firing through the hollow drive shaft, two MG 17 7.92 mm machine guns firing through the propeller arc, or two fuselage mounted MG 17s and a single MG FF 20 mm cannon installed between the cylinder blocks. The BFW team began work on the new aircraft as soon as all issues arising from the RLM’s requirements had been resolved. 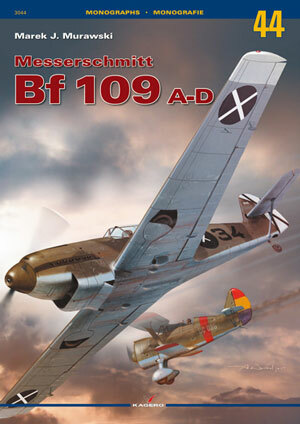 German aviation historian Rüdiger Kosin offers the following: The lessons learned during the design and construction of the BFW Me 108 undoubtedly facilitated the company’s work on the Bf 109 project. Many of the key issues, such as the placement of the main landing gear struts in front of the wing’s spar and the proper distribution of forces acting on the gear wells, or the flight control surfaces arrangement, had already been tried and tested during the development of the Me 108. In fact, the Me 108 looked almost identical to the Bf 109’s proof-of-concept aircraft, or, to look at it from the opposite angle, the Bf 109 was the Me 108 design adapted to a fighter role [Kosin Rüdiger, Die Entwicklung der deutschen Jagdflugzeuge, Die deutsche Luftfahrt, Band 4, Koblenz 1983, p. 108.]. The new aircraft emerged as a cantilevered, low-wing, single-seat fighter, featuring a retractable landing gear and a fully enclosed cockpit. The fuselage had an elliptical cross section and a semi-monocoque duralumin structure covered with stressed, flush-riveted skins. To simplify the manufacturing process, both fuselage halves featured integral frames. Five duralumin longerons installed in each fuselage section provided longitudinal rigidity. The aft part of the fuselage featured an oval, bolted section supporting the aircraft’s tailplane assembly. The fixed tail wheel was attached to its lower surface. The fuselage mid section housed the cockpit covered by a three-piece transparency, which was mounted flush with the aircraft’s spine. The sideways-opening mid section provided access to the cockpit. Under the cockpit floor, and partly underneath he the pilot’s seat, was the L-shaped main fuel tank. The cantilevered, tapered wing was of a full-metal construction and consisted of two sections. It featured automatic slats along the leading edge, as well as conventional ailerons and trailing edge, fabric-covered flaps. Each wing section was mated to the fuselage via three attachment points: at the upper and lower main spar points and at the main landing gear pivot point, which was at the same time the lower part of the engine mount. The wing’s internal ribs were press-formed, which simplified the manufacturing process. The all-metal tailplane featured horizontal stabilizers supported by tubular steel struts covered by aluminum fairings. The horizontal stabilizers angle of incidence could be adjusted from the cockpit from –8° to +3°. A single vertical stabilizer had an asymmetrical profile to compensate for strong propeller slipstream. Flight control surfaces were mass balanced. The rudder actuation mechanism featured steel cables and pulleys, while the elevator was operated by pushrods and steel cables.